Yes, another stir fry post. I love homemade stir fry. 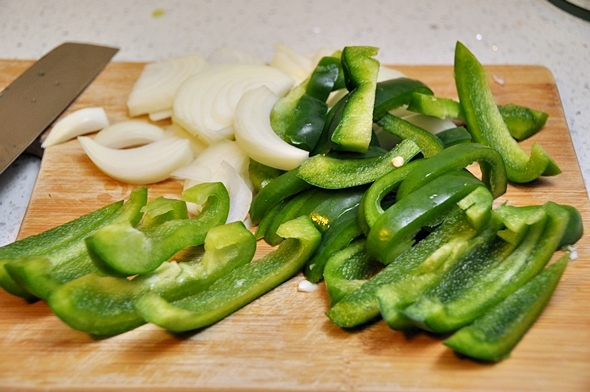 It is fresher and for me, it is a work-week meal crisis solver. Often times, you avoid the soggy varieties that may occur with some takeaway shops. Shudder. However, this is an unusual one because not many people would add turmeric and soy sauce into one dish. 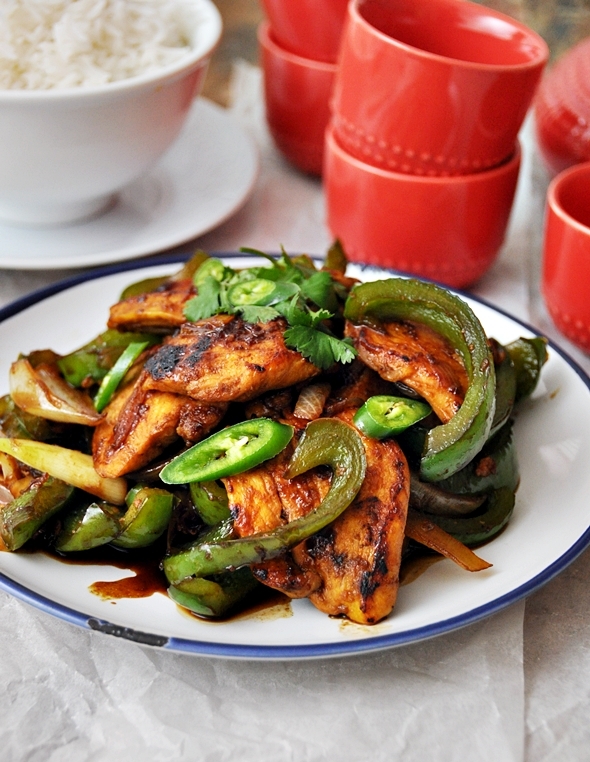 In Malaysia, we would call it ayam masak kicap, which means chicken cooked in soy sauce. This is inspired from my love of Nasi Kandar stalls. Nasi Kandar is a Malay cuisine with a large variety of curries and dishes for your pick. With an array of dishes, I always go for the same thing: ayam masak kicap and beef rendang. A tad too meaty combination to some people but I love it! The thought of these two dishes made me hungry. Oh it was good times! Today, I would like to share with how I make ayam masak kicap at home, with some of my modifications. Usually, you use chicken portions (with the skin and bones) but pre-sliced chicken breasts are easier and take lesser time to cook. 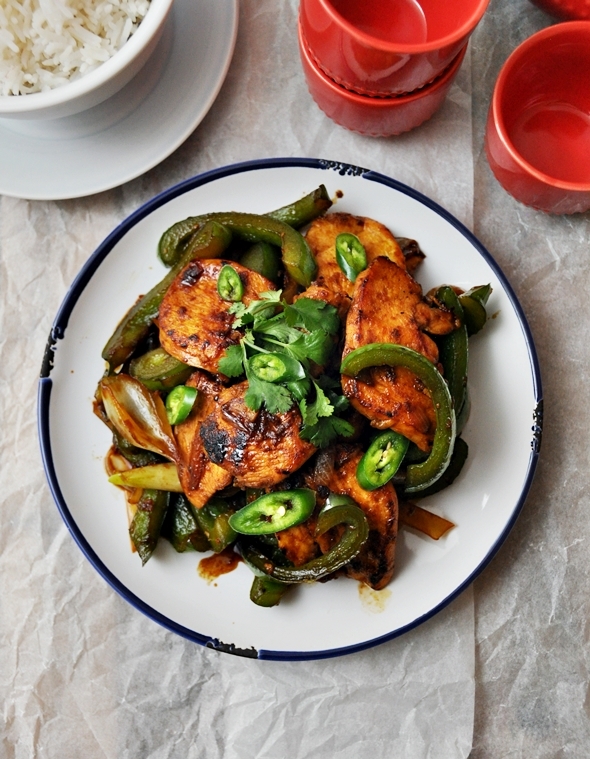 What you’d expect from the dish is a flavor concoction of sweet and savoury from the kecap manis and onions, freshness and pepperiness from the green capsicum as well as earthiness from the turmeric. I dare say that stir fry is boring no more. Enjoy! 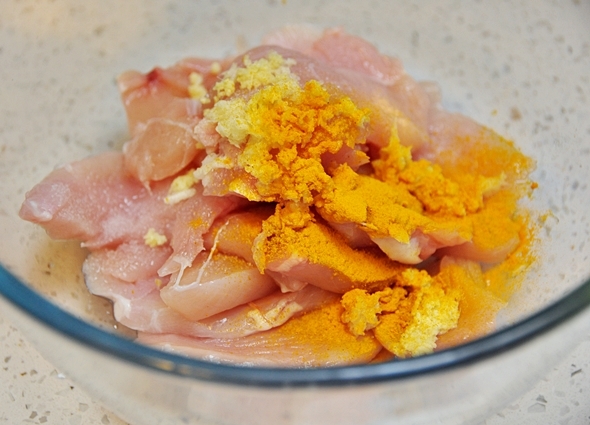 Combine chicken, garlic, ginger, turmeric powder and salt in a glass or ceramic bowl. Toss to combine. Refrigerate, covered, for 1 hour, if time permits. Heat a non-stick frying pan over medium-high heat with some cooking oil. Brown the chicken, in batches, until cooked through and become golden brown (I did mine over two batches). Set the chicken aside on a plate. Clean the pan if there are some burnt bits on the pan. 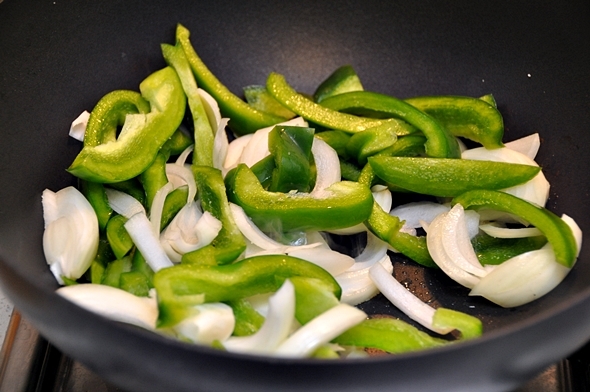 Add a little cooking oil onto the same pan, saute the onion and capsicum until soften. I added 1 tablespoon of water to help with the cooking. 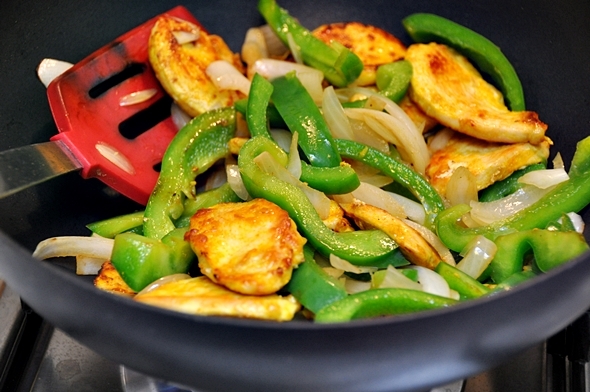 Once the vegetables are soften, transfer the chicken slices back into the pan and mix to combine. 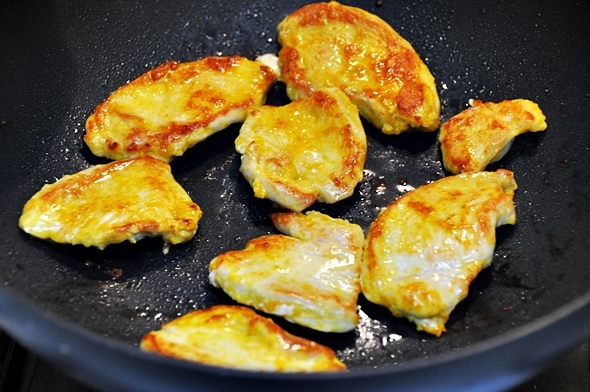 Add kecap manis and mix to combine the chicken pieces and vegetables to be well-coated with the sauce. Taste the chicken. At this point, it will be a little sweet, so add more salt to taste. Finally, scatter some chopped coriander and green chilli just before plating. To serve, spoon rice into bowls. 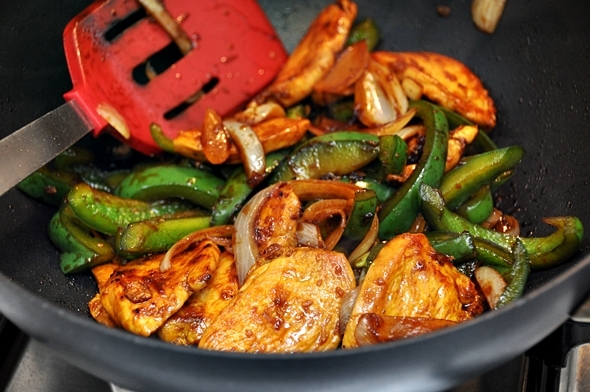 Top with chicken and, pan juices. Serve immediately. Saw this on tastespotting and had to give it a try! This is so delicious and SO easy! Can’t wait to check out more of your fuss free recipes! Thanks for sharing! Hi Emily, I love the simplicity of preparation for this dish and of course, the taste has got to be good!